It is scientifically proven that chipmunks and squirrels are some of the cutest animals in the world. They are lots of fun to watch run around and even more fun to color. 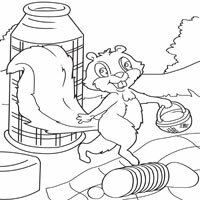 Wouldn't it be great to print and color Squirrel and Dog or Chipmunk with Heart for someone special today?